Well here it is, what we’ve all been waiting for, the showdown between old and new, technology vs. manual, robots vs. humans! Ok, maybe I went too far with that. The topic is not about destruction at the hands of the robot overlords, but more about ways to obtain greater business efficiency and visibility with metrics automation. It is always surprising how many organizations are still using manual reporting on a daily basis especially when they could be much more efficient with an automated metrics management solution in place. Time and again we see organizations that spend weeks and months cobbling together information to create reports for their managers and senior executives. Unfortunately, this means the reports are usually old news and far less actionable. They provide a historic view of what went wrong, but wouldn’t you rather see a current view of what needs to be done right now to get better results? 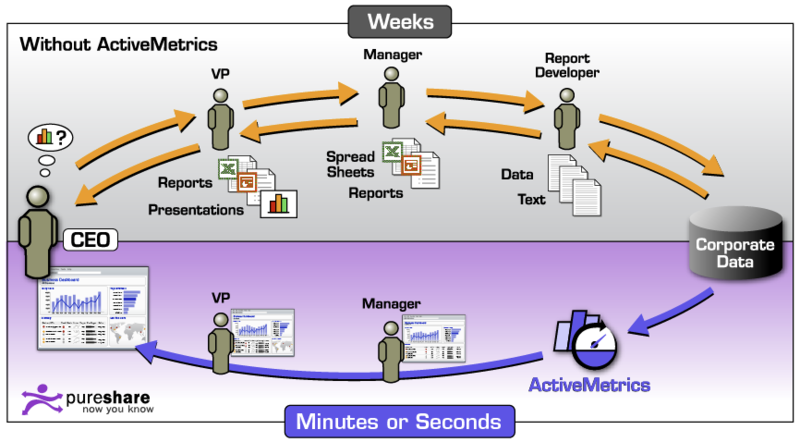 That is what a metrics automation solution can provide to an organization. It enables the deployment of real-time dashboards that can draw data from practically any source, combine them, perform complex computations and present the results needed to make strategic decisions on a daily basis. Just think what you could do with all that free time not spent manually processing report data. It provides everyone with more time to focus on business strategy and less on number shuffling. It delivers real-time actionable answers and is less prone to human-error. It makes life more enjoyable in general. 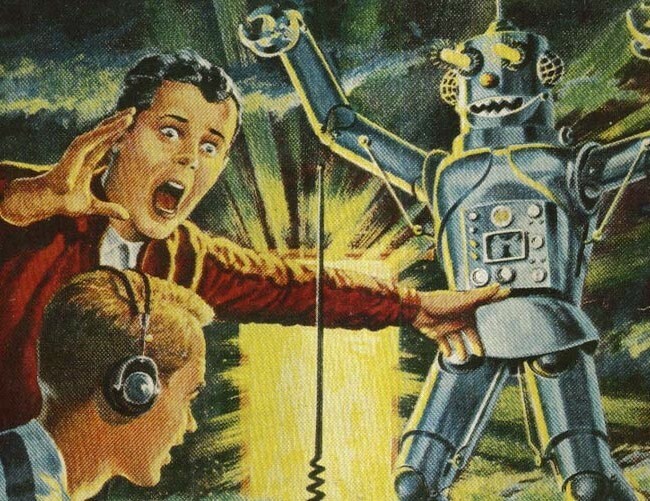 Maybe the robots don’t mean us harm after all! In the diagram above you can see how this process works with an automation system in place. The top section shows how information typically moves through an organization while the bottom part shows the flow with automation in place. This really highlights the speed at which information can be delivered to the various levels of an organization vs. the slower reporting methods. Not only that, but information can be tailored to each level of the business with laser beam like precision. Huge benefits can be seen by shifting from a weekly reporting system to a near real-time automated metrics system. Another benefit of automation is that there is far less chance of human error being entered into the process. By normalizing data, you can limit the chance of each department reporting different numbers due to misunderstandings of what is to be measured or how it should be calculated. This means results are more consistent and reliable, saving time and money. Business Agility Will Make You Better, Stronger, Faster! With automation in place, an organization can begin to shift from a classic “fire-fighting” mode to one that is more pro-active and predictable. A mode that enables rapid connectivity into complex business systems and processes to provide consolidated, real-time metrics. This results in the ability to evolve business measurement strategies at the same speed the business itself is evolving. The business stakeholders are then assured access to high-quality real-time business analytics which are the basis for agile decision making. By having the ability to automate the consolidation of metrics from disparate IT management tools and systems, executives are empowered to make more accurate cost saving decisions. Shifting from a monthly or weekly manual reporting process to near real-time automated metrics lets you move from being reactive to being pro-active, giving you answers through the period rather than only at the end of it. This speed of information delivery to decision-makers will help the entire organization quickly gain strategic alignment, operational efficiencies and top-to-bottom transparency. By getting everyone in an organization ‘on the same page’ using metrics to communicate current performance in the context of targets and objectives, optimization opportunities immediately become evident. Automated and consolidated real-time metrics management is the enabler of this phenomenon and can be leveraged to yield significant performance improvements. A great example of this was seen with one of our global telecom customers. After installing this system they were able to save 1000 work hours a month with the click of a button. Prior to that, operations reporting was managed by six report analysts, each responsible for the collection and consolidation of performance metrics from various management systems including systems management tools, multiple service desks and several contact centers. The work was manually intensive and required interaction between the report analysts to deliver a snapshot of operations performance to executives approximately 30 days later. Today, stakeholders simply click on a launchpad to see performance summaries as needed. With no latency, decisions can be made to materially affect outcomes for the business. Others industries such as hospitality, can leverage automation to give executives the power to drive sales teams to focus on the best opportunities for making sales and revenue goals. In the case of support organizations, having performance information early through metrics means being able to focus on transactions that otherwise might lead to jeopardies in service commitments. A coherent strategy for metrics automation can make all the difference in the world in driving performance outcomes. Automation wins the day! There are just too many advantages that it provides to businesses using this approach. With real-time metrics and performance management, a twenty percent improvement in performance overall is typically achievable with the targeted implementation of consolidated, real-time metrics management capabilities. Let us know if you have any questions about setting up an automated metrics solution for your company.